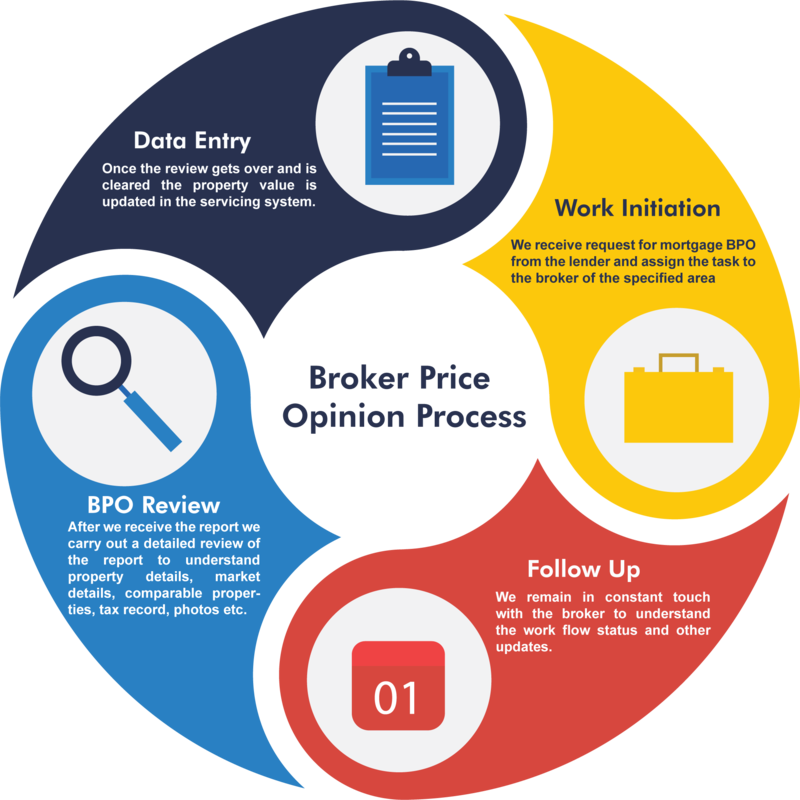 We follow a meticulous approach to procure the right broker price opinions. We order, track, and review BPO to speed up refinance or short sale. Our diligent back office support will help you recover mortgage costs in record turnaround times, while helping you get a fair market value for your underperforming properties. Our clients outsource Broker Price opinion services to us, primarily to leverage the efficiency of an experienced domain expert. Our BPO mortgage services begin with the ordering of Broker Price Opinion on behalf of lenders. We use customized tools and task-specific support teams to place and monitor BPO orders. We provide round the clock support with the management to facilitate property valuation in the shortest possible times. Our BPO order management services encompass all the steps as mandated by law for a property appraisal procedure. We coordinate and follow up with real estate agents to speed up the mortgage BPO process and follow it up with a detailed review of the report. As a global mortgage BPO services company, we track and assign your BPO orders to verify its payment status. We generate periodic reports to give you an idea of the valuation status of all properties on which BPOs have been ordered. Our systematic approach to BPO tracking leverages cutting-edge CRM systems and documents management systems so that a high level of quality can be maintained in the entire process. With an organized approach to BPO tracking, we enable you to keep a close tab on all your underperforming assets effectively. An exhaustive process like a BPO mortgage requires large volumes of data and supporting documents for accurate property estimation. We adopt a checklist-based system to capture and create portfolios of properties for a mortgage BPO. We handle the data entry of comparable properties i.e. extract and include value of similar properties that have been sold in the area recently and the prevailing market prices to help you determine the exact value of a property. We ensure all critical details about the property such as photos, ownership history, location and area details are included for a proper mortgage BPO. Once the BPO mortgage report is completed, we receive the report from the real estate agent and verify it for quality. We scrutinize the report and the methodology used in the BPO. This helps us know the process followed for obtaining the opinion. Our review process ensures that all the physical attributes of the property like the status of renovation or modifications are considered. It also includes cross verifying the trending market value and value of similar properties in the area. We take utmost care to review the comments penned down by the real estate agent after the completion of the process. All these together guarantee accurate property estimation value. Why Outsource Broker Price Opinion Services to Expert mortgage Assistance? Our BPO mortgage services can be customized to suit your property valuation needs. We provide you with a great mix of mortgage experts and modern day cutting edge technology to digitize, manage and maintain all documentation and reports concerning mortgage BPOs. We enrich the mortgage process of lenders with our high quality of work and flexibility. We leverage our experience and expertise in the mortgage industry to handle your property evaluation process with optimum efficiency. As a premier broker price opinion services company, we have a proven track record of excellence with lenders on a global scale. Looking for an experienced mortgage BPO services company to assist you with property evaluation? Outsource mortgage Broker Price Opinion services to Expert mortgage Assistance for robust back office support.